April 19, 2010 Angela G.
This recipe is a playful take on the humdrum grilled chicken salad. Rather than constructing the plate as a salad topped with pannéed chicken breast, arugula and sun-ripe tomatoes are piled atop the protein. The result is lovely and delicious, and the whole flip it around, “Alice in Wonderland” appeal is an approach that we should all take on a wider scale. God forbid we ever get boring or bored or both. The dressing for the arugula is basically an Italian pico de gallo salsa – you macerate the tomatoes with garlic, olive oil and vinegar to form a fresh, bright sauce. If you feel like taking this recipe even further, you can tuck slices of buffalo mozzarella between the chicken breasts for a lovely chicken caprese salad. It’s the kind of dinner that will make you rue the day you settled for a boring salad. Place your chicken in a tupperware or bowl with the rosemary, lemon juice, 1/4 c. of olive oil, a couple pinches of kosher salt and fresh cracked pepper. Stir. Smash two of the cloves of garlic with the flat side of a large knife or cleaver. Toss in the garlic cloves and stir. Refrigerate for an hour or two. Dice your tomato and add to a small bowl. Mince the garlic and toss that in as well, along with the 1/2 tsp. of salt. Using a fork, mash the tomatoes and garlic together until the mixture becomes fragrant. Add the basil, black pepper, and red wine vinegar. Stir and set aside. Heat a grill pan or skillet until smoking. Add the chicken cutlets and rosemary sprig to the pan and cook until browned on each side and cooked through, about 3 minutes a side. To serve, place chicken on plate and liberally top with the fresh tomato dressing. 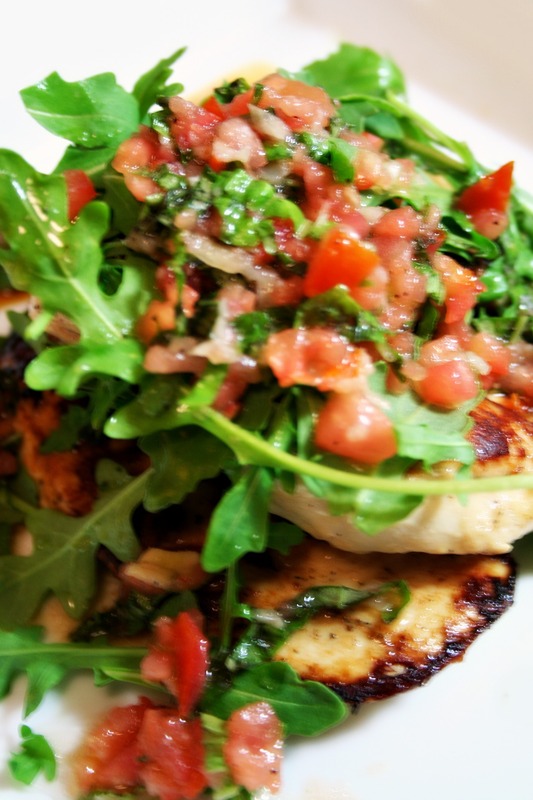 Top chicken with a handful of arugula and then drizzle a bit more tomato dressing on top of the arugula. Dig in!